Terezin Music Foundation, a non-profit organization dedicated to preserving information about the Terezin (Theresienstadt) concentration camp, has published Liberation, an anthology of poetry with contributions from 63 of the world’s most renowned authors, representing 25 countries. In 2015 venues, TMF board and Executive Director Mark Ludwig honored the 70th anniversary of the liberation of the Nazi camps by producing concerts in Prague and Boston, followed by a series of poetry readings. 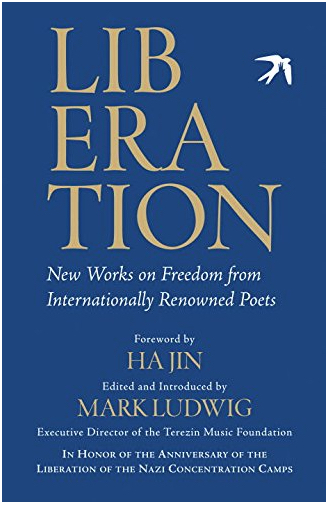 The Liberation anthology is now available in paperback. The distinguished group of contributors to the anthology includes such luminaries of the contemporary poetry world as Rita Dove, Robert Pinsky, and Yusef Komunyakaa. Marilyn’s poems “Bamboo, the Dance,” and “Memorial Haibun” are included in this outstanding anthology.